Ancient and modern tragedies converge in Theater of War Productions' Antigone in Ferguson. Theater of War Productions has brought classical drama to some very tense and sometimes dangerous places: Rikers Island, Guantánamo Bay, Fukushima. 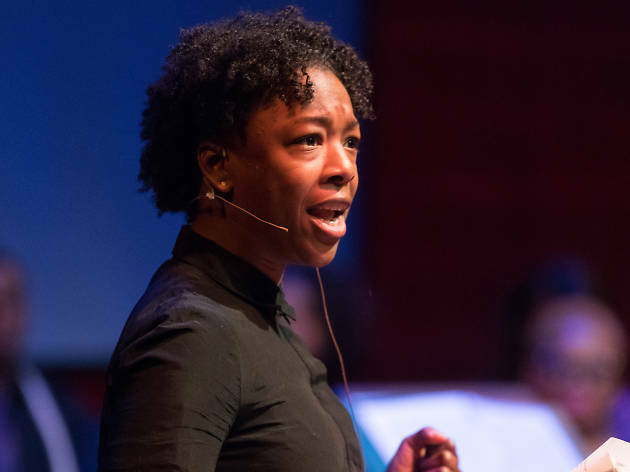 Using texts that range from the ancient Greeks to modern writers such as Tennessee Williams and Eugene O’Neill, the New York City–based company engages audiences that are coping with trauma, such as veterans, the incarcerated and survivors of natural disasters. But artistic director Bryan Doerries hesitated when he was approached about taking his troupe to Missouri in the aftermath of Michael Brown’s 2014 death, which sparked days of civil unrest. “Nothing intimidated me more than the idea of going to Ferguson,” Doerries says. “We’re trying to reverse the flow of culture." Before black teenager Brown was killed by a white police officer, Doerries says, he had never done a production “that was explicitly about race.” He was, however, familiar with Missouri, having performed in prisons, military bases and churches across the state. It was a staffer from the governor’s office—a parishioner at the St. Louis church where Brown’s funeral was held—who reached out to Doerries about coming to Ferguson. “It just felt like we had to do something,” Doerries recalls. He chose Sophocles’ tragedy Antigone, whose conflict revolves around “a body that is desecrated,” reminiscent of the rage that swelled in the community as Brown’s body lay in the street for hours. Doerries provided his own adaptation of the text and brought in a cast that included famous faces from television: Samira Wiley (The Handmaid’s Tale), Gloria Reuben (ER) and the late Reg E. Cathey (The Wire). Choir members from the area took the stage as the chorus, performing songs composed by St. Louis native Phil Woodmore. “Part of the design of the project was to bring people with oppositional views together,” Doerries notes, and Woodmore’s chorus did just that; its members included Brown’s former teachers, social justice activists and, controversially, local police officers. As a 29-year veteran of the St. Louis Metropolitan Police Department, Lt. Latricia Allen sees the events surrounding Brown’s death from multiple perspectives. 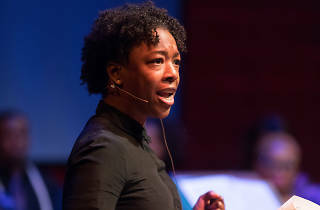 “I absolutely love my job,” she says, “But when I put that down, I’m still going to be an African-American woman and a mother.” Allen sang in the choir and participated in postshow panels during Antigone in Ferguson’s premiere run. “I never thought that I could cry so much,” she says. Antigone in Ferguson plays at Harlem Stage Sept 13–Oct 13. Tickets are free but reservations are required. Walk-up tickets will be available 30 minutes before each show on a first come, first served basis.